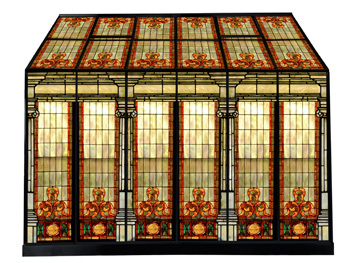 Conservatories, greenhouses, sunrooms and solariums all benefit from Stained Glass Inc. panels. Conservatories and Greenhouses from Stained Glass Inc.
Stained glass conservatories are a great way to add beauty and drama without sacrificing practicality. Here at Stained Glass Inc., our talented designers have the ability to create a unique and beautiful sun room that is composed entirely of stained glass. These eye-catching solariums will not only offer increased privacy from neighbors or other onlookers, they will also look stunningly beautiful, both inside and out, throughout the entire year. Because we use shatter resistant polymer glass to create our designs, there is no need for you to worry about the damaging effects of hail or other elements on your custom greenhouse. In addition, our translucent, all-weather stained glass panels will soften the sunlight, providing added UV protection, while still allowing your plants and flowers to receive the sunlight they need to stay healthy and beautiful. If you are looking for a more traditional way to incorporate stained glass in your conservatory, Stained Glass Inc. can provide you with window inserts. These inserts are easy to install and can be customized to fit any size, shape, or color you desire. Our talented team of designers will be happy to assist you in designing a beautiful stained glass insert for your custom solarium. Give us a call today! We are here to assist you. Our stained glass artisans can answer your questions and help you design the stained glass conservatory you've always wanted.